The PEAK 2 PEAK Alpine Experience connects Whistler and Blackcomb Mountains via a 4.4 km gondola ride. The breathtaking journey offers stunning mountain and wildlife views (we saw bears!). The ride is so smooth and calming that we felt like we were on top of the world. This engineering marvel has actually broken three world records: Longest unsupported span of 3.024, highest lift of its kind (436 m above the valley floor), and completes the longest continuous lift system on earth. Woah! Ticket prices vary per age and season, but a summer adult ticket costs $44.95. We were fortunate to received a 25% discount since our friend is a season pass holder; another way of saving is to book online. What does the ticket include? 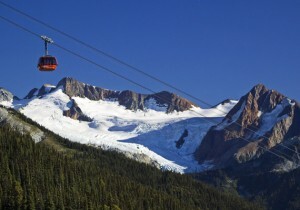 A ride up the Whistler Village Gondola which is located at the base of Whistler Mountain. 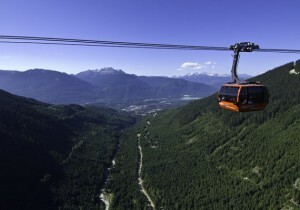 From there you have access to the PEAK 2 PEAK Gondola with unlimited crossings for the day. What to do at the top? Enjoy panoramic views, dine at 6,000 feet at the alpine, or check out the many hiking and walking trails. FYI: Sweaters, light jackets, walking or running shoes are recommended attire. Temperature can change quickly and it’s at least 10 degrees cooler than at the base, even in the summertime. Canada’s First Pinkberry Opened In West Vancouver! The Coldest Ice Bar In The World!